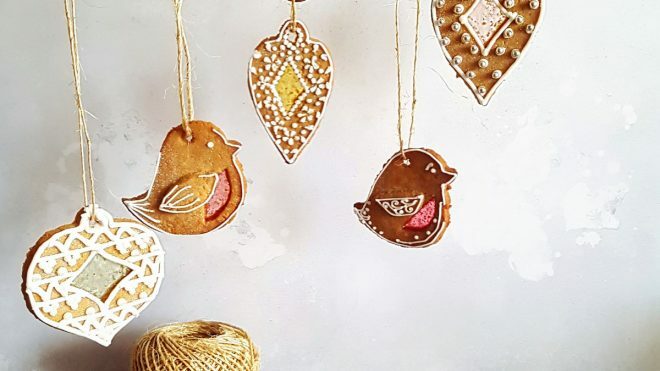 Get the family together and whip up a batch of these delicious, spicy gingerbread decorations. 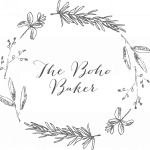 This recipe makes approximately 50 cookies: that’s enough dough to make the decorations for the tree and the ones that “accidentally” fall into your cup of tea when they come out of the oven. Preheat your oven to 200C/fan 180C/gas mark 6. Over a medium/low heat, melt the butter, sugar, and syrup in a pan. The mixture should resemble warm treacle. Mix the flour, bicarbonate of soda, and ground ginger in a large bowl, and then stir in the butter mixture to make a still dough. If it won’t quite come together, add a tiny splash of water. Roll out your gingerbread dough to the thickness of two £1 coins stacked on top of each other, directly onto a sheet of baking paper (do not use any flour as this will cause the dough to dry out). Cut out your decorations using cookie cutters or freehand with a sharp knife. Poke a hole at the top of each decoration using a skewer. Carefully cut a diamond shape out of the centre of each decoration and place one boiled sweet inside. If you prefer a stained-glass effect, place the boiled sweets in a bag first and break them up with a rolling pin. Fill the diamond cut out with shards of different coloured sweets. Bake in the oven for 12 minutes per sheet, or until your gingerbread is golden. Remove from the oven, and leave to cool on a wire rack. Whilst your gingerbread is cooling, whisk the two egg whites in a bowl until stiff peaks are formed. Sift in the icing sugar, and fold until a thick, glossy icing is formed. If your icing is too stiff, add some water a splash at a time to loosen it up. Thread string or ribbon through the hole of each gingerbread. Pipe your design using the royal icing, and leave to set for 15 minutes before hanging on the tree. If you don’t have time to make the decorations right away, just wrap the gingerbread dough in clingfilm and pop it in the fridge for up to 3 days.